In the days before mechanical refrigeration, natural ice was cut from the Cedar River and stored year-round in this unusual building. Hugh Smith, owner of the Cedar Falls Ice and Fuel Company, replacing an earlier wooden structure that burned down, built it in 1921. The Ice House is 100 feet in diameter, with hollow tile walls 30 feet high, and it could hold 6,000 - 8,000 tons of natural ice. Ice was stored here until 1934, when the Cedar Falls Ice and Fuel Company went out of business. Ownership then passed to the Cedar Falls Trust and Savings Bank. The building was used as a livestock sales pavilion and ice skating rink until 1938, when members of the Cedar Falls Boat Club purchased it. Title was then transferred to the city, which leased the building to the Club for $1 per year. 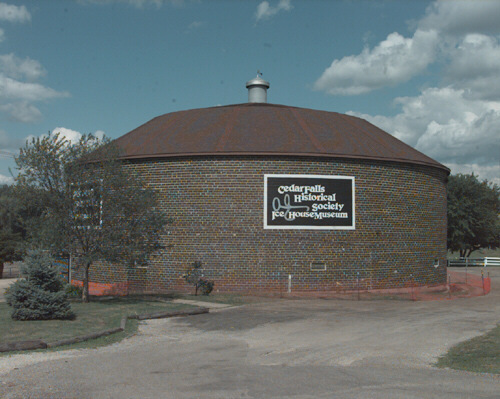 The Cedar Falls Ice House is the home of the Ice House Museum, operated by the Cedar Falls Historical Society. The museum contains artifacts of the ice cutting industry as well as other items related to the history of Cedar Falls. It is listed on the National Register of Historic Places. The Museum is open May 1 through October 31 on Wednesdays, Saturdays and Sundays from 2 to 4:30 p.m. Admission is free. For more information or to arrange a tour, call (319) 266-5149.